This article is about the county in Utah. For the other county of the same name (in Colorado), see Grand County, Colorado. 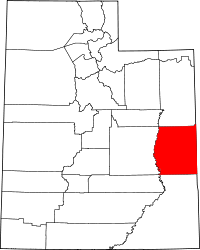 Grand County is a county on the east central edge of Utah, United States. As of the 2010 United States Census, the population was 9,225. Its county seat and largest city is Moab. Evidence of indigenous occupation up to 10,000BCE has been seen in Grand County. The present city of Moab is the site of pueblo farming communities of the 11th and 12th centuries. These groups were already vanished when the first European explorers entered the country; instead, nomadic Ute tribes were here. The European-based settlement of the area began with arrival of Mormon pioneers in 1847. By 1855 they had sent missionary-settlers into eastern Utah Territory. An Elk Mountain Mission was established, but closed after a few months due to Indian raids. For several decades thereafter, the future Moab area (known as "Spanish Valley") was visited only by trappers and prospectors. Permanaent settlement began in 1877. These early settlers, coming in from the north, encountered the deep canyon walls of the Grand River and were unable to take wagons over, or around, the steep canyon walls. They unloaded their supplies, dismantled the wagons and lowered them by rope to the river valley. They then drove their oxen over a canyon rim, down deep sand dunes. After the wagons were reassembled and supplies reloaded, they made their way through the deep sand to the river. They found a place to ford the river, below the present bridge in north Moab. They later established a ferry at the crossing site, which remained in use until the first bridge was built in 1921. In 1881 the area was known as Grand Valley, and Moab was a "wild west" town. A 1991 visitor to Moab later said it was known as the toughest town in Utah because the area and surrounding country has many deep canyons, rivers, mountains and wilderness areas, becoming a hideout for outlaws. The local economy was initially based on farming and livestock. Mining came in at the end of the 19th century, and the railroad arrived. The first school in the county was started in 1881. Mormon settlers began planting fruit trees by 1879, and by 1910 Moab was a significant fruit-production center. Due to the distances involved, the settlers of eastern Emery County found it difficult to conduct county business in that county's seat. By March 13, 1890 their petitions caused the Utah Territory legislature to designate the eastern portion of the county as a separate entity, to be named Grand County, named for the Grand River (whose name was changed to Colorado River in 1921). The county boundaries were adjusted in 1892 and in 2003. Exploration for deep petroleum deposits began in the 1920s, and this industry has made significant contribution to the economy since that time. Other significant industries include uranium mining, and filmmaking. Grand County lies on the east side of Utah. Its east border abuts the west border of the state of Colorado. The Green River flows southward through the eastern part of central Utah, and its meandering course defines the western border of Grand County. The Colorado River enters the east side of Grand County from Colorado, flowing southwestward toward its confluence with the Green in San Juan County, south of Grand. The Dolores River also enters Grand County from Colorado, flowing westward to its confluence with the Colorado River near Dewey. Grand County terrain is arid, rough, and spectacularly carved by water and wind erosion, exposing red rock formations that have created a solid tourist industry. The area is little used for agriculture unless irrigation is available. The terrain is filled with hills and protuberances, but generally slopes to the south and to the west. Its highest point is Mount Waas in the SE part of the county, at 12,336' (3760m) ASL. The county has a total area of 3,684 square miles (9,540 km2), of which 3,672 square miles (9,510 km2) is land and 12 square miles (31 km2) (0.3%) is water. Deserts, cliffs and plateaus make up the scenery, with few settlements apart from the city of Moab, a Colorado River oasis. Arches National Park lies in the southern part of the county, just north of Moab. A northern portion of Canyonlands National Park lies in the southwest corner of the county. As of the 2000 United States Census, there were 8,485 people, 3,434 households, and 2,170 families in the county. The population density was 2.31/sqmi (0.89/km²). There were 4,062 housing units at an average density of 1.11/sqmi (0.43/km²). The racial makeup of the county was 92.65% White, 0.25% Black or African American, 3.85% Native American, 0.22% Asian, 0.05% Pacific Islander, 1.66% from other races, and 1.32% from two or more races. 5.55% of the population were Hispanic or Latino of any race. There were 3,434 households out of which 29.80% had children under the age of 18 living with them, 48.60% were married couples living together, 10.70% had a female householder with no husband present, and 36.80% were non-families. 29.50% of all households were made up of individuals and 9.50% had someone living alone who was 65 years of age or older. The average household size was 2.44 and the average family size was 3.06. The county population contained 26.90% under the age of 18, 8.20% from 18 to 24, 27.90% from 25 to 44, 24.50% from 45 to 64, and 12.50% who were 65 years of age or older. The median age was 37 years. For every 100 females there were 96.30 males. For every 100 females age 18 and over, there were 95.10 males. The median income for a household in the county was $32,387, and the median income for a family was $39,095. Males had a median income of $31,000 versus $21,769 for females. The per capita income for the county was $17,356. About 10.90% of families and 14.80% of the population were below the poverty line, including 21.20% of those under age 18 and 8.40% of those age 65 or over. Grand County has been described as the Utah county with the lowest percentage of LDS Church members in the state. Utah's population overall is about 62% Mormon, while Grand County is about 26% Mormon. Grand County generally votes Republican. In only two national elections since 1964 has the county selected the Democratic Party candidate (as of 2016). 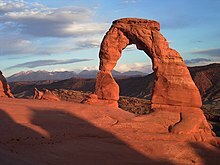 Moab has a significant environmentalist population due to nearby Arches National Park and Canyonlands National Park. Grand County residents protest a BLM study area on July 4, 1980. Grand County was an epicenter of the Sagebrush Rebellion which took place during the late 1970s and early 1980s, when local residents protested what they saw as overreaching Federal control of Western US land. An early event in the Rebellion was July 4, 1980, when 300 Grand County residents gathered behind a flag-decorated bulldozer, in protest of the inclusion of Mill Creek Canyon as part of a Bureau of Land Management wilderness study area. Despite plowing nearly 200 yards up the canyon, the group did not reach the study area's boundary. The Denver Museum of Natural History opened a small Cedar Mountain Formation quarry that has produced diverse dinosaur fossils including theropod, sauropod and ornithopod. An adult sauropod was designated the type specimen of the genus Venenosaurus. ^ a b "State & County QuickFacts". United States Census Bureau. Archived from the original on July 10, 2011. Retrieved December 29, 2013. ^ "2010 Census Gazetteer Files". US Census Bureau. August 22, 2012. Retrieved March 27, 2015. ^ "US Decennial Census". US Census Bureau. Archived from the original on May 12, 2015. Retrieved March 27, 2015. ^ "Historical Census Browser". University of Virginia Library. Retrieved March 27, 2015. ^ Forstall, Richard L., ed. (March 27, 1995). "Population of Counties by Decennial Census: 1900 to 1990". US Census Bureau. Retrieved March 27, 2015. ^ "Census 2000 PHC-T-4. Ranking Tables for Counties: 1990 and 2000" (PDF). US Census Bureau. April 2, 2001. Retrieved March 27, 2015. ^ "First US Tar Sands Mine Could Open in Utah". Reuters. Retrieved November 25, 2012. Wikimedia Commons has media related to Grand County, Utah. This page was last edited on 4 April 2019, at 23:11 (UTC).